Romulo was kind enough to grant me an interview on Saturday, which I'll be sharing in instalments over the next month or so. This is part one of five. slideyfoot.com: You’re a top competitor in BJJ, but also an instructor. Is teaching helpful for developing your BJJ game, or does it detract from your own training? Romulo Barral: I think teaching helps a lot, because when you teach, you work on details of the technique. When you roll, you have details, but sometimes you use power, sometimes you overpower somebody who is not as strong as you. So when you’re teaching, you develop a lot of details, and then every day you teach, even if it’s the same technique, you can see another detail. slideyfoot.com: Your instructor, Draculino, is well-known for producing champions, like yourself. What do you think is the key to effectively teach BJJ? 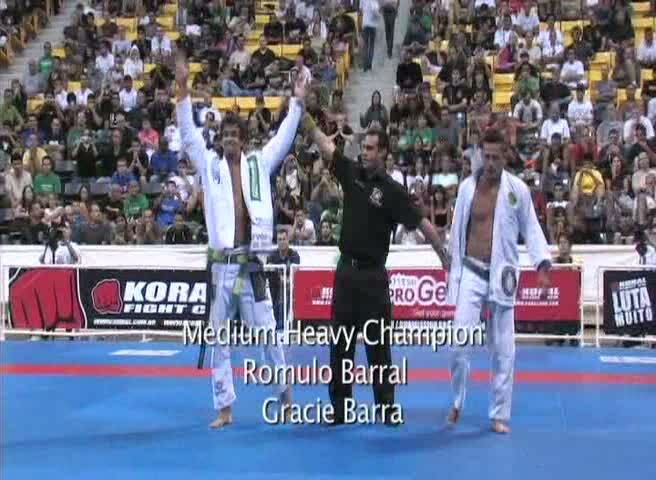 Romulo Barral: I think the key, to teach BJJ or compete, you’ve got to put a lot into what you do. You need to put everything in to make people get better. I have seen a lot of people, when they’re teaching, they don’t put in a hundred percent. They don’t want to show everything, all the details for their students to get better. So, Draculino – I train with Draculino since I was a teenager, it has been a long time, maybe more than ten years ago - his style of teaching is like this. He gives everything for you, everything. He is not teaching only his style, only his details. He is trying to show you everything, so you can choose your own type of game, or you can be complete, learning everything from him. His style, it is my style, you know. I learn from Draculino, and I try to pass to my students now what I learned from him. slideyfoot.com: Do you think it is beneficial to split the beginners into a separate class for a few months, or is it more productive to have a mixed ability class from the beginning? Romulo Barral: Definitely, you’ve got to split them. You cannot have somebody who has never seen jiu jitsu before in their life come into class and do spider guard, flying triangle, something like that. So, Draculino, that’s another thing Draculino has success with, because maybe like six or seven years ago, it used to be everybody in the same class. If somebody new came into the academy, they’re going to be the same class as the black belts. So Draculino – I don’t remember, maybe more than six or seven years ago – he started to split the class, and then he started to do a curriculum class. Like, this is a fundamentals class, and these guys go to the advanced class. He’s got to take a little while here, you know, until they pass through the basics. When he was doing that, I think he made a big difference. First, the students, they weren’t quitting the training, they kept going, because they were training with people on their level. Also, all the students had strong basics, strong fundamentals, so when they pass to the advanced class, they were learning much faster. slideyfoot.com: So he had a set curriculum of say escaping side control for a few weeks, then mount, then submissions, that kind of thing, or was it more just general principles? Romulo Barral: It was all the basic positions, you know. There were all the situations, but the basics. Like you said, side control, couple of attacks, basic attacks, and basic escapes. Then, mount, basic attacks, basic escapes. Very consistent, like that: couple of takedowns, self-defence. All the basics they would need to go to the next level, so they’re not going to be lost. slideyfoot.com: Following on from that, if the beginners class is with that clear structure, how would the advanced class differ? Would it still have a curriculum or is it more of a “this week we’re going to do 50/50, this week we’re going to do reverse triangles”? Romulo Barral: You know, a lot of places, they still don’t have a curriculum. My place, Draculino’s place, we always have a curriculum. You cannot go to the class, drive your car, and then think “oh, what am I going to show today? I’m going to show spider guard today.” Then the next day, you drive again, “what am I going to show today? Today, I’m going to show mount attack.” It’s very important you break down the curriculum, so you can work all the types of game. For example, let’s work for two months on spider guard, maybe spider guard sweeps, spider guard attacks. I think that is the best way for people to learn and develop their own game, so you can teach everything, not focus on one thing. You’ve got to have a curriculum for both parts. Ooh you dark horse, that came as a surprise! How cool that World Champion black belts are digging the whole interview on a blog thing now! Lucky Slidey. I also like how you're asking questions that you personally are interested in, not what you think the audience wants to hear. good work, I look forward to the rest mate. Really enjoyed this first part of the interview. It's really interesting to hear things from another perspective. Our school does things differently, but I can see why curriculum is so important. That's how my mind would probably work, too. @Allie: Thanks! That topic was on my mind, because I had been chatting about it with Kintanon not long before the call with Romulo. Great questions, Slidey. Looking forward to the next installments. I train at Gracie Barra Texas under Draculino. He's a fantastic teacher and super nice guy. We went and trained at his school in Belo Horizonte, Brazil, earlier this year. He has a stable of world class blackbelts that have come up under his tutelage there. It was an honor training with them. If you ever get a chance to catch one of Draculino's seminars, don't miss it. He's hilarious and pays attention to the most minute detail. It's worth every penny.